With cheers and hugs, 11 new volunteer care specialists graduated last Saturday from One Source-Empowering Caregivers’ fifth training session since the program began in the fall of 2016. “What a wonderful blessing it was to have 11 more individuals step forward and offer their time, energy, and their own experiences in the caregiving arena,” said Donna Raibley, founder and executive director of One Source-Empowering Caregivers. “We now have an amazing group of more than 50 compassionate and conscientious volunteers who are willing to give the most important thing to caregivers: time and love!” said the effusive Raibley. After completing 22 hours of intensive training over three consecutive Saturdays, the new volunteer care specialists will be carefully matched with compatible caregivers and begin deploying in the coming week, said Harriet Totten, One Source-Empowering Caregivers volunteer coordinator. For up to four hours a week, a volunteer care specialist comes to the home of a 24/7 caregiver to take over non-medical companionship of the care recipient. “The service gives ‘care free’ time to the caregiver at no cost to the caregiver,” Raibley said. The new graduates are Barbara Duval; Carolyn Seyler, R.N., M.S. ; Lynn Maas; Kathi Kenedi; David Lerner; George Roberts; Maki Anderson; Chris Swanson; Debra Adams; Myra Brooks; and one volunteer who requested anonymity. “We respect the privacy wishes of our volunteer care specialists just as we do for our caregivers and care recipients,” Raibley said. HIPAA, the federal Health Insurance Portability and Accountability Act of 1996 requires One Source-Empowering Caregivers to keep clients’ confidential information under lock and key. “We extend that same protection to our volunteers if they ask for it,” she added. 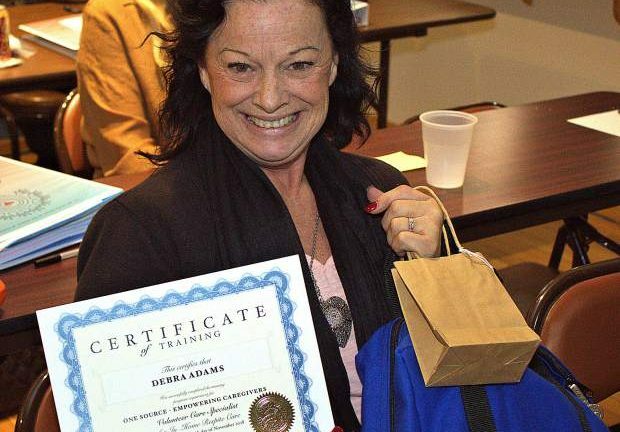 During the graduation ceremony, the volunteer care specialists were awarded a Certificate of Training, a photo ID badge and a HIPAA-compliant locking blue bag for the CPR-certified care specialists to keep emergency supplies and confidential case management notes. “If you have four hours a week to give, I highly recommend it,” said volunteer care specialist Marcia Harper in the Village video. She graduated last spring. “You’re going to get so much back than you’re going to give. It gives me goosebumps just thinking about what the experience is,” Harper said. In the video, former caregiver Julie Holmes Ball explained how volunteer care specialist George Grist (aka Hap Hazard of KVMR community radio) brought joy to her and her late husband Dennis’ final days. The training of the Volunteer Care Specialists is free. The nurses, lawyers and disability and elder care experts who provide the training are all volunteers. And of course, the service to caregivers and care recipients is free. Additionally, BriarPatch Food Co-op donates the continental breakfasts and nutritious lunches during the three days of training. What’s more, Raibley takes no salary as executive director or as president of the board of directors. Nevertheless, rent, utilities, the thick training manuals, background checks on the volunteer care specialists, the HIPAA-compliant bags and other related and administrative costs are not free. Raibley, however, often negotiates significant discounts and in-kind donations from suppliers. One Source-Empowering Caregivers relies heavily on private donors, competitive grants and contests — and fundraisers like the HeART and Wine Gala and silent art auction held at the Nevada County Fairgrounds last month, which netted $18,000. One Source-Empowering Caregivers is a 501(c)3 nonprofit organization, and donations are tax-deductible. The organization maintains a Facebook page of current news. Currently, the Facebook page is presenting weekly installments of It Takes a Village. The whole 40-minute video will be posted on YouTube after Thanksgiving, including One Source-Empowering Caregivers’ Mission-Values-Vision statement, the documentary itself, and a fun blooper reel after the credits. The Facebook page will also feature a photo album of pictures taken during this latest training. To donate or sign up for the next volunteer care specialist training, contact Donna Raibley at 530-205-9514 or 530-802-6154 or https://www.empoweringcaregivers.org. Tom Durkin is a media consultant to One Source-Empowering Caregivers. Contact him at tdurkin@vfr.net or http://www.tomdurkin-media.net.